We are one of the agencies within the niche holding an official partner badge from Google. Founded and established in 2004, Forefront Digital are at the pinnacle of Google Adwords Management. We have been providing this service to all of our marketing clients since the start, managing their Google Adwords accounts for Pay Per Click (PPC) optimisation, ensuring that they are spending the right amount of money, focusing on the right keywords, and are achieving the results that they deserve. Forefront Digital is a qualified Google Partner. What does this mean for you? It means that we always have somebody working from Google by our side, ensuring that everything that we do benefits your business to the fullest, ensuring that we are not wasting our or your time – as we know, time is money. You are always guaranteed to be ranking on page one for your chosen keyword, at the very minimum cost available. Out of the vast ocean of other digital agencies offering Google Adwords management, we are one of the agencies within the niche holding an official partner badge from Google. In all honesty, it’s just not worth going to any other agency for this service. 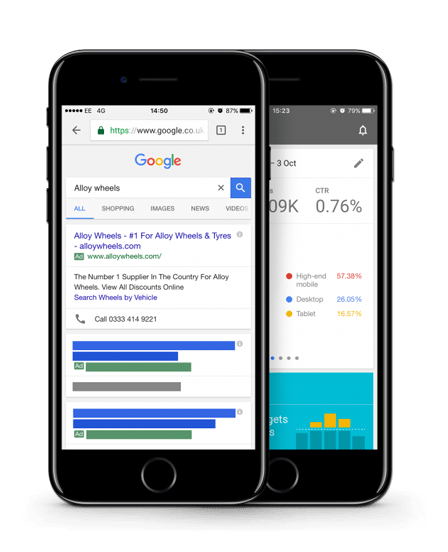 We’re the leading innovators in Google Adwords management, meaning that we are constantly changing the way that we run things. This ensures that we are constantly maintaining an innovative service unlike any other agency, providing you with opportunities that seem unbelievable to any other Adwords management company on the market. We provide competitive prices at a competitive work rate. We make a plan for all of our clients over the month, ensuring that each customer gets the time that they deserve and are paying for. We have a first class customer support engine, which allows us to be able to see every client, enabling us to be able to update all of our clients with the necessary information as to how their Adwords management is going. We use livechat, email and telephone technologies to ensure that we are available all day, Monday to Friday.